This is an original oil painting don on gallery wrapped stretched canvas. I once as a child ate a whole jar of these I loved them so much. Gee whiz was I sick after that. I think I shouldn't have drank the juice. Is there anything more purple then Lilacs? 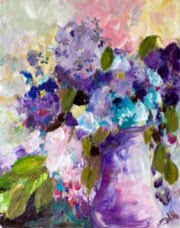 Maybe, but to me if I think purple I think Lilacs.This floral painting of purple Lilacs is done in oils. Lilacs bloom in early May. There is a lot to be said about having a large vase of Lilacs by your bed as you drift off to sleep with that glorious smell. I always get caught up in the drama and romance of them. It is interesting how the scent can conjure up memories and I am in a time machine taken back to another time and place. The fragrance takes me back to a time as a child on the farm playing in the warm spring air under the Lilac bush. The lilac was so old it was more like a tree then a bush. Climbing its gnarly branches and siting up so high where no one could see me, I would read my adventures of places I wanted to see in the lilacs. Can you smell the lilacs through my words? I think I was in the pink mode today painting pink poppies. Mercurio: Why, I am the very pinke of curtesie. "'Tis the Pink of the Mode, to marry at first Sight: - And some, indeed, marry without any Sight at all." The 'pink of the mode', i.e. the acme of excellence of fashion, was a common early usage and continued to be used throughout the 19th century. The finest quality watercolor were used in this painting. Of course this is home grown Michigan Asparagus painted just for you. Great artists have always enjoyed painting floral themes, whether capturing fields of wildflowers, exquisite blooms in vases or simply the perfection of a single fallen petal. Fruits in bowls also frequently appeal to the painterly eye. Then there are vegetables, the supposedly less-exciting garden inhabitants: sometimes supple, often juicy, of all colors and shapes.I think it is the bright bold colors that keep me paintng vegetables again and again. Artists who bring vegetables to the canvas seem just as appreciative of beauty — yet with an added sense of pragmatism, since vegetables not only look aesthetically pleasing, but they are wonderful to eat cooked or raw. I didn't get my tomatos canned yesterday but I did get one painted. Pears are so much fun to paint, I keep going back to them. I'm not sure which I like to paint more pears or peppers? My tomato's are are ripe in the garden so I will be canning at some point today. I am a very visual person, what ever is in my visual field at the moment is the most real thing for me. So what ever activity I start has a lot to do with what I paint. I bet I end up with some paintings of tomato's before the day is over. Now off to the post office to ship paintings that have sold. oil on gallery wrapped stretched canvas.The back is wired and this painting can be hung as is or framed. Painters paint for all kinds of reasons. I am inspired by the things I see and think about. The scenery around me, landscapes, and all the various kinds of flowers. This painting has been sold, please contact me if you would like me to paint a similar one for you. I have been commissioned to design 2 labels for wine bottles. One is for their line of reds and the other for their white wine. I am trying to think wine for a few days to get me in the mood. I like strong colors but wine label is a unique thing, a very personal item. The label on the bottle is an important item. It must invoke curiosity and introduce the brand. About This Painting: Its always nice to come to flowers. A lovely bunch of summer flowers painted in oils make this a warm welcome home. 8x10 oil on canvas mounted on hard board. This landscape was painted in in Plien air. I did a few studies of sunflowers a month ago for a larger painting but have had several commission that I have been working on and still have not done the large sunflower painting that I would like to do. This is another small study. I am still trying to work out the details of how I want the large painting to work. 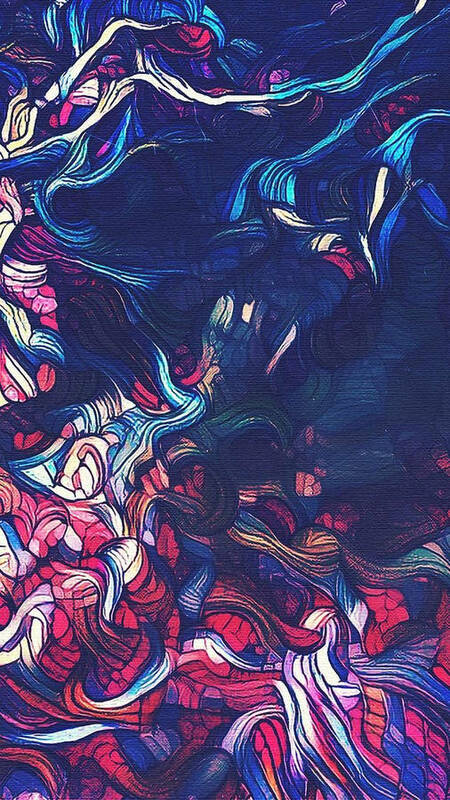 Abstract Expressionism is suppose to invoke an emotion in the viewer.Today my emotions are in teal. Abstract Expressionism has no distinct image instead you are looking at how someone feels how it comes across as action,color,and movement. My paintings are always full of color and movement but with this series of abstract work I am concentrating on how I feel at this moment.Today I feel Teal. This painting is done in oil on gallery wrapped stretched canvas the sides have been painted and the back is wired. It may be hung as is or framed. Today I painted in an intensely emotional manner. I emphasized not an objecst but subjective emotions that expressed my mood. This is an oil painting on gallery wrapped stretched canvas with painted sides.The back is wired and the painting can be hung as is or framed. Down the road from where I live the farmer has bailed his hay. When I went for my moring walk I saw the bails into day the morning light and knew I would have to paint them.I missed the morning light today but will give it a try on another day. This painting was done in a wondeful garden in Napleon Mi today. I was painting on the shore of Lake Michigan, between rain storms for the wet paint fund raiser at the Tvedten Gallery in Harbor Springs. The fund raiser was for the little Traverse Conservancy and Watershed council paintings will be on display until the end of Aug. The above painting is not in the show but two others are. I was a frame short when I go to the gallery and had to pick between 2 that I had done that were 8x10. To see the other painting stop in at the gallery in Harbor Springs Michigan. About This Painting:I have been painting for a week in the north of Michigan. The back is wired and sides are 1.5 and painted. This painting can be hung as is ro framed if you like.